Sound "What most defines [the SmartSub system's] performance is the inability to discern the subwoofer's position -- localization effects are nonexistent." "Tremendous low-frequency power and extension, but also...exacting finesse and bloom. There was more bass and better bass." "One thing the SmartSub did that other very good subwoofers also accomplish is spreading the soundstage laterally and imbuing it with a more physical presence." Features "The SmartSub lineup comprises four subwoofers that range in price from $2900 to $8900 USD," all of which "can be connected at the line or speaker level." "But this is where the similarities to traditional subwoofers end. Gone from the SmartSubs are the standard adjustments for phase, crossover slopes, output and the like. These are replaced with a few adjustments on the SmartSub itself, and either a passive crossover for use with various models of Thiel loudspeakers or the SI 1 Integrator, which tailors up to 16 (!) SmartSubs for mono or stereo use in home-theater and audio-only systems and with any main speakers." Use When using the Integrator, the results you achieve are only as good as the data you enter, and if the maker of your main loudspeakers, for instance, pads sensitivity and bass-extension figures, you will end up with less-than-perfect results." [they] are beyond reasonable criticism." Subwoofers have become standard equipment in home-theater systems. The boom and crash of big-budget movies require additional bass output (I'm not sure why explosions have to be felt as well as heard, but such is the way of the A/V world), and home-theater receivers and processors have built-in functionality specifically for subwoofers. Very rarely is a home-theater system sold without a subwoofer, and very rarely does a speaker company not have a subwoofer -- or three -- in its product lineup. Bass, it appears, is a growth sector of the audio industry. However, subwoofers are still considered add-ons for music-only stereo systems, perhaps because so little music requires subterranean low-frequency reinforcement, more likely because we audiophiles are so picky that we won't accept poorly integrated bass. We still try to extend the response of our speakers downward, often with mixed results. For every audiophile who thinks highly of the bass he gets with his subwoofer there is another -- or three -- whose results are decidedly unmusical. The reason for this is simple: setting up a subwoofer is a job for someone with expertise. The control panels of many subs look as daunting to consumers as the control panel of an airplane to someone visiting the cockpit for the first time. And in both cases, pushing buttons and turning knobs haphazardly only leads to poor results -- or worse. With all of this as background, Thiel Audio decided to rethink the subwoofer. The outcome of literally years of work is the company's line of SmartSub subwoofers, passive crossovers, and the innovative SI 1 Integrator, the first such products from Thiel. All aim at simplifying the process of integrating a subwoofer into an A/V or stereo system and addressing a number of performance issues. It's an understatement to say that Thiel Audio offers a line of subwoofers. In fact, a substantial portion of Thiel's current product line is devoted to providing deep bass. The SmartSub lineup comprises four subwoofers that range in price from $2900 to $8900 USD, with the SS2 reviewed here coming in at $4900. 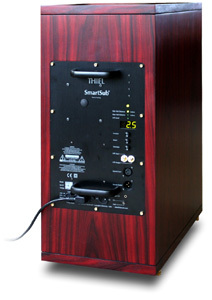 All SmartSubs are powered and can be used at the line or speaker level. But this is where the similarities to traditional subwoofers end. Gone from the SmartSubs are the standard adjustments for phase, crossover slopes, output and the like. These are replaced with a few adjustments on the SmartSub itself, and either a passive crossover for use with various models of Thiel loudspeakers or the SI 1 Integrator, which tailors up to 16 (!) SmartSubs for mono or stereo use in home-theater and audio-only systems and with any main speakers. In assessing the performance of existing subwoofers, Thiel identified a number of specific problems that they felt required attention. These include problems with output, distortion and uniformity; problems with sonic integration with the main speakers; and problems with room interaction. 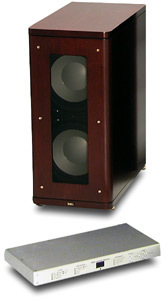 To address sheer output capability, Thiel designed a series of special drivers. These aluminum-cone woofers boast very high excursion -- 1 1/4" peak to peak -- and engineering that takes full advantage of this range of movement without introducing other issues. To move the air that such drivers are capable of propelling, the dual-driver SmartSub SS2, SS3 and SS4 have internal 1000-watt switch-mode amplifiers that offer high efficiency and low heat. The differences among these models is in the size of the drivers and cabinet, and therefore the output capabilities. The electronics remain the same. The single-driver SS1 uses a similar 500-watt amp. Bass distortion and uniformity problems are addressed in the design of the drivers and the SmartSub's electronics. The drivers use Thiel's short-coil/long-gap motor system, which is said to result in distortion that's one-tenth that produced by conventional drivers, along with a copper pole sleeve and ring, which stabilize the driver's magnetic-field strength and thereby further reduce distortion. Uniformity refers to the ability, or inability, of a subwoofer to deliver deep bass as the voice coils of the drivers heat up, which can increase resistance by 70% and lower output by up to 4.5dB. To solve this, each SmartSub measures the temperature of the drivers' voice coils and adjusts the gain and frequency response of the internal amplifier to ensure that there is no compression or imbalance while the drivers are being stressed. Sonic integration and room interaction have always been issues with subwoofers. If the problem with a subwoofer is not the inability to blend it with the main speakers, it is the deleterious interaction with the room, or both. To address integration, Thiel created the SI 1 Integrator, which takes speculation out of setting up a subwoofer for use with main speakers that will be sealed or ported and whose low-frequency extension may be great or not. There is also the variable of the main amplifier used, its voltage gain, which affects the output of the entire system at a given volume setting. Room interaction is addressed inside each SmartSub, where measurements to walls are entered, adjusting and correcting output accordingly. One thing I wondered right off was if furniture, especially large main speakers, might affect this data. "No," was Jim Thiel's response. "Bass wavelengths are so long that furniture is not an issue." If this discussion of design considerations seems cursory, it is. However, for those of you who want more insight, Thiel has created a well-written ten-page white paper that covers all of the SmartSub's and Integrator's innovations. It is very good reading. Like all Thiel loudspeakers, the SmartSub SS2 is beautifully made, with furniture-grade touches. If you need to match a SmartSub to your existing speakers or décor, Thiel can do it, either by matching veneer or replicating just about any finish. The SS2 is a solid mass, 11"W x 23 1/2"H x 20"D and 108 pounds, whose rear-mounted handles make it a heavy, but feasible, one-person lift. The cabinet is constructed completely of 1" MDF. Thiel loudspeakers often use multiple layers of MDF for their baffles, but, according to Jim Thiel, because of the width of the basket of the SmartSub drivers, baffle strength is not an issue with the SmartSubs, whose baffles are 1" thick. Also, there is no worry of bass energy exciting the baffle and mucking up the midrange or treble. All inputs and controls are on the rear, with the only front-mounted feature being an LED that, when lit, indicates that the SS2 is on. You can turn this indicator off if it bothers you, a thoughtful touch. The $4400 SI 1 Integrator shows the same attention to detail as the SS2. You can enter data either from the included remote control or via the front-panel buttons, while various LEDs and the center-mounted readout let you know the values. You can also store up to six groups of options, presumably for using the same subwoofer in multiple configurations with multiple speakers. The rear panel is packed with RCA and XLR inputs and outputs along with a set of five-way binding posts for speaker-level connection. The unit measures 17"W x 2"H x 9"D and weighs 4 pounds. I also want to point out that the manuals that come with the SS2 and Integrator are comprehensive and very useful. They don't go into too much detail (Thiel saves its white paper for that), but they do give you all of the information you'll need to connect and configure the products. Thiel took its time bringing the SmartSub lineup to market, and it shows. The SS2 and Integrator have the earmarks of mature products even though they are new. Testing a subwoofer system of the sophistication and claimed broad applicability of the SS2/SI 1 Integrator is not quick, easy work. Therefore, I used both products with four very different pairs of loudspeakers. Floorstanders included Thiel's own CS2.4 (which I also used with a Thiel passive crossover specifically for the CS2.4; see comments below), Paradigm Signature S8 and Wilson Audio MAXX 2. The one minimonitor I had on hand was Merlin's TSM-M, which sat on 24" Osiris Audionics Osiris sand-filled speaker stands. Amplifiers were Lamm M1.2 Reference and ML2.1 SET monoblocks. Preamps were a Lamm L2 Reference, Classé Audio CP-500 and Mark Levinson No.32 Reference. Digital source components were an Esoteric DV-50 universal player, Audio Research CD3 Mk II CD player, and a Zanden Model 5000 Mk III DAC fed by either a Mark Levinson No.37 transport or the Audio Research CD player. Interconnects and speaker cables were from AudioQuest (Air and Volcano), Analysis Plus (Solo Crystal Oval and Solo Crystal Oval 8) or Cardas (Golden Reference), with either an Audience Au24 or i2digital X-60 BNC-terminated digital cable connecting the Zanden DAC and its transport. Power cords were from Shunyata Research -- Anaconda Vx, Anaconda Alpha, Taipan, Diamondback and Python -- as was power conditioning, via the mighty Hydra Model-8, which was plugged into a Shunyata Silver Venon AC outlet. The first step to setting up any Thiel SmartSub is situating it in the room. I used the SS2 in the left-hand corner of my 20' x 29' listening room and between both stereo speakers, although offset slightly to the left or right to test for directionality issues. While other subwoofers have problems with room boundaries, and especially corners, to various degrees, the SmartSub is configurable in order to alleviate boundary aberrations. Once you've figured out where you want to place your SmartSub, you measure from the walls nearest to the side and rear of the subwoofer and enter the distances into the SmartSub itself. This is done in fractions of a meter, so you'll need to convert measurements in inches and feet. Next, you need to figure out how you will use the SmartSub, which is determined by your system and main speakers. Any of the SmartSubs can be used simultaneously in a home-theater/stereo system. The main speakers, however, determine whether you'll use the SmartSub with the SI 1 Integrator or one of Thiel's model-specific passive crossovers. If you have only Thiel speakers, you should opt for either a PX02 stereo ($350) or PX05 multichannel ($500) crossover, which make setup a breeze and mate seamlessly with the SmartSub. I tested this with a pair of CS2.4 speakers, and the results were very impressive, extending the low-end reach of the CS2.4s and making the speakers and sub sound as one -- and as one of Thiel's larger speaker systems. The Integrator will work with Thiel speakers, of course, and does afford greater adjustment flexibility. Jim Thiel admitted that in some installations with Thiel speakers the Integrator may be a better choice than the passive crossover. I found the two to offer no sonic advantage over each other, but your wavelengths may vary. If you've purchased the Integrator, you will connect it to your system and enter the data that will mate the SmartSub to your main speakers. This involves, first, determining in which mode you'll use the Integrator. As a rule of thumb, if your main speakers are floorstanders that have nearly full-range sound, you will use augment mode. If you have minimonitors or floorstanding speakers with limited bass and output capabilities, you'll use crossover mode. After determining this, you connect the Integrator to your preamp/processor or amplifier and the SmartSub. At a minimum, you will need an additional pair of stereo interconnects for connection to your preamp or processor and a single interconnect that will reach the SmartSub. You may need extra speaker cables as well. Most of the data that you will enter into the Integrator doesn't invite or require experimentation, but some of it, like the voltage gain of your amps and sensitivity of your main speakers, must be gleaned from the manuals of those products or perhaps a phone call to the manufacturer. Entering data is a snap -- four buttons on the Integrator's remote control or front panel allow you to move among the various parameters and increase or decrease their values. However, as you can probably guess, the results you achieve are only as good as the data you enter, and if the maker of your main loudspeakers, for instance, pads sensitivity and bass-extension figures, you will end up with less-than-perfect results. If this is the case, check our speaker-measurements archive, www.speakermeasurements.com, to see if we've measured your speaker. You can get accurate data there. There are three parameters that you will need to enter into the Integrator that may require a little extra understanding than the others: Low Frequency Extension, Low Frequency Level and Crossover Frequency. These three adjust exactly what their titles suggest, and they can greatly affect the outcome of your setup, either negatively or positively. Low Frequency Extension determines how extended the bass response will ultimately be. The lower the better, right? Theoretically, yes. However, at some point, you may tax the SmartSub beyond its capabilities, especially with material that has a great deal of low-frequency energy. The idea, therefore, is to find the point at which the SmartSub can keep up with the signal fed to it and deliver bass that's as low and powerful as possible. I settled around 32Hz in my large room. For long-term use, I would be a candidate for either a larger SmartSub or another SS2. Low Frequency Level controls how much bass boost or cut (up to 6dB) will be produced by the main speakers and/or SmartSub. I tried this setting at every level, and in every instance preferred 0 -- no boost or cut. In most instances, this is where you should keep this setting, but it can be used to add or subtract bass as your main speakers and room may require. Err on the side of being conservative, although experimentation with the remote control is easy. Finally, Crossover Frequency, which is available only when you use the SmartSub and Integrator in crossover mode, is perhaps the most critical of the three. I asked Jim Thiel about it, and his suggestion was a setting 10Hz higher than the -3dB point of the main speakers (another value you have to enter into the Integrator). Instead of going into the theory behind this parameter, of which there is a great deal, I will just say that Jim Thiel's recommendation will likely work very well, but you can also tune this by ear with the remote. As I mentioned, I used the SmartSub and Integrator with very different speakers, testing the system in both crossover and augment modes. With the Thiel CS2.4s, Paradigm S8s and Merlin TSM-Ms, the blend with the subwoofer was perfect. However, with the Wilson Audio MAXX 2s, the SS2 just couldn't provide enough bass below the big MAXX 2s in augment mode, and didn't provide the same low-frequency detail and bloom of the MAXX 2's woofers in crossover mode. This didn't surprise me. The only reason anyone would add a subwoofer to the MAXX 2s, which have 10" and 13" woofers and a quoted -3dB point of 21Hz, is to re-create the very lowest organ notes at realistic levels, in which case more than one SmartSub is required. The MAXX 2s have wonderful bass, and trying to blend them with just about any subwoofer, even one as advanced as the SS2, is mostly an academic exercise. Thus, the listening comments that follow are based on the use of the SS2 and Integrator or passive crossover with the other speakers I've mentioned. Once the SmartSub system is sited, set up, adjusted and integrated, what most defines its performance is the inability to discern the subwoofer's position -- localization effects are nonexistent. Many (most) subwoofers can augment bass to a noticeable degree, but few can do so while achieving sonic invisibility. So often reviewers will ask the rhetorical question "Where is the subwoofer?" when they encounter speakers with very good bass performance. With the SmartSub system, that question becomes, "Where are the large floorstanding speakers?," so thoroughly does the SmartSub blend and disappear. Naturally, I pulled out some favorite recordings that have noteworthy bass: Harry Connick's She [Columbia CK 64376], Walter Becker's 11 Tracks of Whack [Giant 24579-2], Suzanne Vega's Nine Objects of Desire [A&M Records 31454] and Holly Cole's Temptation [Metro Blue 7243 8 31653 2 2]. All were rendered with tremendous low-frequency power and extension, but also with exacting finesse and bloom. There was more bass and better bass -- exactly what we want from a subwoofer. The opening of "Joe Slam and the Spaceship" from She gives woofers and subwoofers seizures, but the SmartSub didn't rattle or bottom out. My listening room is rather lossy and on a concrete slab, but the SmartSub still caused the doors and windows to chatter. But what I kept coming back to was the way the SmartSub disappeared. Even when a track's bass energy was squarely in one channel, as with the bass guitar on "Virtue" from Ani DiFranco's Up Up Up Up Up Up [Righteous Babe RBR013-D], the SmartSub never shifted or otherwise changed the image, except to extend the low frequencies of the bass guitar. When the SS2 was set up in the far left corner, the bass guitar in the right speaker did not drift. This suggested to me that Thiel is onto something significant with its work on room boundaries in the setup and configuration of the SmartSub. One thing the SmartSub did that other very good subwoofers also accomplish is spreading the soundstage laterally and imbuing it with a more physical presence. The soundstage sounded bigger and more three-dimensional due to this "ambient bass." Cowboy Junkies' Whites Off Earth Now [RCA 2380-2-R] is a live recording made with a single microphone, and with the SmartSub system in use, the performers sounded bigger and more sculpted, the entire presentation seemingly swelling in all directions. This is one of the uncelebrated benefits of a very good subwoofer, and one of its defining characteristics as well. Subwoofers aren't just about bass; they can enhance the presentation in other ways, which is what the SmartSub system did. And so it went with recording after recording. As the SmartSub was called on to increase the weight and reach of the low frequencies, it did so. Yes, I could muck up the sound by changing the values entered into the Integrator, increasing the Low Frequency Level especially, but when used properly, the SmartSub system did exactly what it was engineered to do. The SmartSub SS2 and SI 1 Integrator are expensive, $9300 together, but if you have Thiel speakers, you can save a chunk of money by going with one of the passive crossovers, and for strict LFE use you don't even need this. On grounds of setup or performance, however, the SmartSub and Integrator are beyond reasonable criticism. I have some good news, some bad news, and more good news. The good news is that I have heard and reviewed a subwoofer that is a direct competitor to the larger SmartSub models, Wilson Audio's WATCH Dog, which has been superseded by the WATCH Dog Series 2 ($10,950), a subwoofer that's identical performance-wise to its predecessor. The bad news is that I heard the WATCH Dog in a different room, with different speakers, over two years ago. Back to the good news -- I used the WATCH Dog for almost a full year, so I remember it well, and I have an entire review of my impressions to fall back on. You've been briefed. Setting up the WATCH Dog is much easier than setting up the SmartSub. That's because your Wilson Audio dealer will deliver and set up the WATCH Dog for you, and you'll have to do the work with the SmartSub. However, it should be apparent that the SmartSub is far easier for an end user to place and configure. The WATCH Dog retains the standard adjustments of most subwoofers and adds a built-in equalizer for taming trouble regions. While I had the WATCH Dog, I was able to achieve good results with Wilson Audio's Sophia loudspeakers, but the WATT/Puppy 7s gave me fits that John Giolas of Wilson Audio had to straighten out with his greater know-how and handheld RTA. The WATCH Dog is also very large and weighs 283 pounds, which cuts down on placement options and thereby makes set up trickier. With the SmartSub, you can follow Ron Popeil's sage advice almost to the letter: "Set it, connect it, configure it, and forget it." Performance is where these two super-heavyweight bass systems start to converge -- and deviate again. As I noted in my review, the WATCH Dog can pressurize room to a degree that very few subwoofers or speakers can. The SmartSub SS2, with Integrator or passive crossover, didn't accomplish this to the same degree (in a much larger room), but it did produce gut-wrenching low frequencies (if a wrenching gut is your thing) and never gave away its position. I don't recall that the WATCH Dog exactly telegraphed where it was in my listening room, but it didn't seem to achieve the utter invisibility of the SmartSub SS2. The WATCH Dog had slightly greater transient impact, a quicker thrust on big bass-drum whacks and the like, but the SmartSub system was no slouch. I also think the WATCH Dog was a little better at broadcasting ambient bass and thereby expanding the soundstage. Which of these super subwoofers would I choose? If I owned any speakers except those from Wilson Audio, I would pick the SmartSub system because of its user-friendly interface and extraordinary performance. I also think I could re-create the WATCH Dog's feat of pressurizing the room and spreading the soundstage by adding a second SmartSub SS2 or moving up to the SS3 or SS4. In either case, I could still use the Integrator or passive crossover -- extra SmartSubs daisy-chain to each other. However, it makes sense to choose the WATCH Dog for use with Wilson Audio speakers. It mates well with even the big MAXX 2s and models above, and there's much to be said for matching exactly the finish of the subwoofer to that of the main speakers. I know of no easier way to add great low bass than Thiel's SmartSub lineup, whose user friendliness is matched by the sheer performance of these forward-thinking products. The brainpower and effort behind the SmartSub lineup would be for naught if the products didn't deliver on the implied promise of easier and better. They do -- subwoofer and controller/crossover are easy and nearly foolproof to use, and the results are deep, powerful, non-directional bass that gives the aural illusion that your speakers have sprouted a new woofer -- or three. Of course, the SmartSub lineup is aimed at home theater as well, and I have no doubt that the SS2 and its brethren will be just as impressive with movies. I'm a snob -- music is tougher to get right than explosions, so it stands to reason that explosions should be impressively portrayed as well. I give a standing ovation to Jim Thiel and the gang at Thiel Audio for not only conceiving of the SmartSub and its ancillaries, but making them a reality. Thiel has taken a well-known product, addressed its deficiencies, improved its performance and made it more intuitive to use. Voilà -- they've re-engineered the status quo. Prices: SmartSub SS2, $4900 USD; SI 1 Integrator, $4400.